Eau Sauvage Parfum (2012) is a popular perfume by Dior / Christian Dior for men and was released in 2012. The scent is spicy-woody. The longevity is above-average. It was last marketed by LVMH. I find this one an instant hit with people who love interesting perfumes. This just goes to show that time and time again that the house of Dior under Demachy can produce outstanding work - on par with niche. In fact, Eau Sauvage Parfum feels like a niche fragrance. I think that the notes of bergamot, vetiver & myrrh are slightly misleading and simplistic, there is still a trace of the Hedione molecule which is the DNA backbone of the Eau Sauvage line (a synthetic jasmine and bright lemon combination). Again, this fragrance provides excellent quality for money in my opinion. I find it remarkable in that respect, and in my experience has also given me compliments! I can't really fault it for anything, except perhaps to say that it can be a little heavy if over-applied. I would definitely recommend this not for people still getting into perfume but for men and women out there who have an experienced nose in perfumes. A great sophisticated fragrance for a man and an intriguing one for a woman. There's definitely something dark and mysterious with this one. Reminds me of a man wearing a velvet tuxedo. Mysterious, in control, and with a hint of danger and sexiness. Very very good. An instant hit with perfume-heads and worth well beyond the asking price. Eau Sauvage Parfum has an amazing dark bottle with magnetic cap and a lovely dark green color. Opens with a very strong, dark and smoky citric scent. Later the note that is the most prominent is the myrrh. One of the best Vetiver based fragrance on the market. The more you wear it, the more you love it. It has the best longevity and sillage among Vetiver based fragrances I have ever tried. This is my Dior Eau Sauvage Parfum 2012 Review on YouTube. I figured it was time to re-review this beast of a flanker to the original classic men's fragrance by Dior from the 1960s. What we have is 3 awesome notes of Bergamot, Myrrh and Vetiver amped up to the max. It's delicious and unique enough to be a completely different scent from the original Eau Sauvage but using just the three important notes from Eau Sauvage to make for an awesome and long-lasting fragrance experience for the man who wants to be bold wearing Eau Sauvage. I highly recommend this release from Dior and anyone who wants potent and beast-mode fragrances should definitely seek out Eau Sauvage Parfum. To find out more about Eau Sauvage Parfum 2012 please watch my video. Thank you. Although not being a fan of other Eau Sauvage versions, this one is really something for me. Neoclassical, potent, masculine and somehow modern. Great for open space, city walks etc. Allegedly composed of three notes, but very complex underneath. Bitter bergamot from start till end of fragrance life. Dry and sweet miro resin accompanied by floral note of osmanthus. I detect some curry undertones (Eau Noire? ), and beautiful strong and smoked vetiver. Classic, mature and unpretentious. One of the best offerings from Dior lately. Irrelevant to its ancestor (Eau Sauvage 1966 which is a true classic and sophisticated enough to serve for generation after generation) the current edition borrows only few elements from past and resigns: citrus and vetiver. Eau Sauvage Parfum proclaim a sharp blast of fougère lavender that is found in abundance in Amouage Sunshine Man. It’s warm, damp and conjures up olfactory impression of tanning oil. The lavender is chamfered by bergamot and lemon in top, and amplified by sandalwood, vetiver and myrrh in base. The fragrance is a modern fouègre with earthy hints of vetiver and sweet smoky nuances of myrrh that guarantees for wonderful projection and enormous longevity. Difficult to love in a first sniff..
A dominating Myrrh fragrance from the start till middle , very powerful and somehow different from the available lot...I like the opening though it takes some time to familiar with , initially it reminded me of a cough syrup but gradually the beauty unfolds itself resultingly you will have a lovely musky woody and smoky fragrance and I love this part the most , ....stunning fragrance with very good sillage and longevity. Thumz up. Sweet myrrh and lemons, Eau Sauvage Parfum is another masterpiece by Dior. It's a linear scent that envolves you for a long time. Vetiver is really present, but not green and bright like in many fragrances. It's resinous but a little sweet at the same time. Big thumbs up! Eau Sauvage Parfum opens with a blast of balmy green myrrh that is extremely potent and stays the star of the show throughout. This is not the typical myrrh you may be used to, but one that passingly resembles Tiger Balm. Vetiver plays a supporting role, but the myrrh really is all consuming and overshadows everything else. I do get just the slightest passing relation to the classic Eau Sauvage, but the parfum really is a very different scent with an entirely different vibe. The scent is extremely linear and I noticed no real change from start to finish. One spray of this bad boy and I seemingly was projecting for miles and the longevity was insane. I really went into my sampling with the expectation of liking Eau Sauvage Parfum as I love the classic Eau Sauvage, but alas it was not meant to be. This one is just too in your face with the almost wintergreen-like balmy myrrh that wears you down over time until you can't take it anymore. The scent is obviously well-made and projects and lasts forever, but when the smell is this annoying I would rather it disappeared instantaneously. I will always have a place in my heart for the original, but Eau Sauvage Parfum will never reside in my wardrobe. It really is not terrible and I almost gave it a neutral rating, but the smell is really giving me a headache and I'll take that as a sign it should really get a thumbs down. 2 to 2.5 out of 5 stars. Even with a modern touch, Eau Sauvage still remains very much... French. The myrrh is an interesting facet, acting as the middle-ground to this fragrance. The warm, balmy, resinous, smoked earth elements gives Eau Sauvage Parfum an appreciable Eastern ambiance. Captured in the same classy bottle dressed in black, with a new and improved magnetic cap. Symbolic to the fragrance, as it is quite drawing and I might add, entrancing. A masterpiece that sits alongside Dior Homme Intense Eau de Parfum with quality comparable to the Dior Addict classic. This perfume would compliment a wool, cashmere or double-breasted peacoat. A fragrance so deep and intense will only thrive in the winter. I’m a great fan of Eau Sauvage. I don’t have a recent bottle and am not sure what shape the current model is in. Mine is from 2001-2002, I’d guess. It’s floral, it’s pretty, it’s old-school fresh. It’s bright and inherently shiny. I had a strong sense of déjà vu on sniffing ESP, and a few minutes into trying it, I knew why. Eau Sauvage Parfum smells remarkably similar to Parfums de Nicolai’s Vie de Chateau Intense, nearly Calandre/Rive Gauche similar. In my review of Vie de Chateau last year I mentioned the original Eau Sauvage, writing, “compare the first sniff of each side by side!” I don’t see this similarity as plagiarism, just as I didn’t mean to imply that Vie de Chateau was a copy of the original Eau Sauvage. More likely it’s kismet and a similar outcome from talented people investigating a similar set of ideas. I’d go so far as to say that Eau Sauvage Parfum is one of the best, most thoroughly executed mainstream releases I’ve smelled in years. It is definitive, it smells exceptionally good, and it demonstrates a classical perfume’s virtues of coherence and development. Taking Eau Sauvage, an icon, as a starting place, thinking broadly and in the end giving us a smart gem of a perfume---this is what I want from a flanker. I’ve seen ESP called a vetiver fragrance, a myrrh fragrance. I find that the notes of hay & tobacco, the moist warmth/coolness fairly shout coumarin. Just as the swan is both ends of the spectrum in one entity, Eau Sauvage Parfum (like Vie de Chateau) comes off as a fougère/chypres hybrid taking the best form each genre. 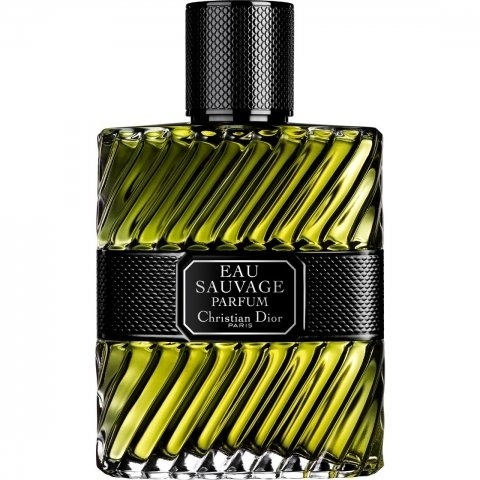 Write the first Review for Eau Sauvage Parfum (2012)!